Senators Marco Rubio (R-FL) and Mike Lee (R-UT) released their plan to reform the federal tax code last week. The proposal would overhaul both the individual and corporate tax codes, provide a significant boost to the economy, lift incomes across the board, and result in a $1.7 trillion tax cut over a ten year period. The plan includes a number of pro-growth provision. It would cut the top tax rate on business income to 25 percent for both corporate and noncorporate businesses, move to full expensing of capital investments, shift to a territorial system, and integrate the corporate and individual tax code by eliminating taxes on capital gains and dividends. The proposal would also simplify the individual tax code. It would reduce the number of tax brackets from seven to two with a 15 and 35 percent tax rate, replace nearly all deductions and exemptions with a refundable personal credit, and create a new $2,500 child tax credit. 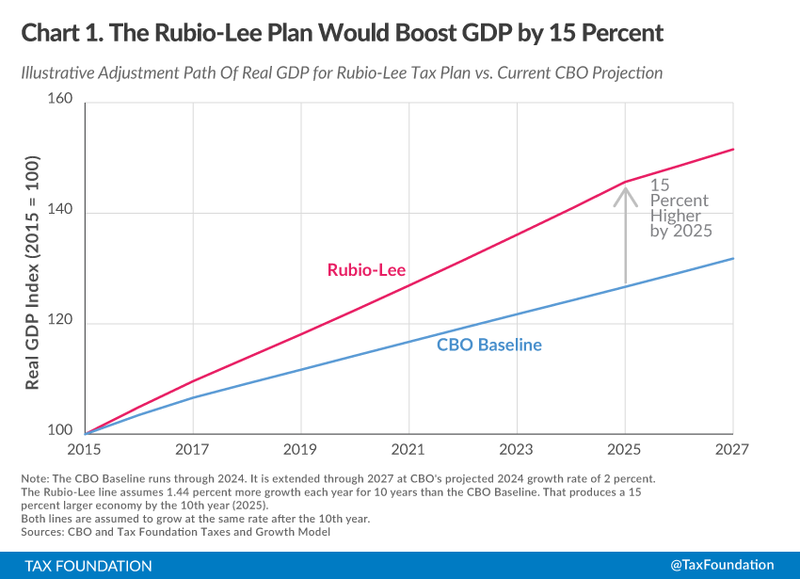 According to the Tax Foundation’s Taxes and Growth Model, the changes proposed by Rubio and Lee would increase the size of the economy by 15 percent over the next ten years, boost wages by 12.5 percent, and increase employment by nearly 2.7 million jobs. This level of growth in equivalent to additional GDP growth of 1.44 per year over the next ten years. On top of the 2 percent growth projected by CBO, this is an average of 3.44 percent annual growth over the next ten years. This level of growth is still below the growth seen in the 1950s and 1960s and only slightly above the growth seen in the 1970s, 1980s, and 1990s. This is the type of growth one would expect following a fundamental change toward a neutral, consumption-based tax code. However, it’s important to note that this growth won’t happen overnight. It will take time for the economy to adjust to the new tax system. The largest growth would likely be seen in the middle of the decade (perhaps years two through five) and slowly phase-out as the estimated ten-year adjustment period comes to an end. On a static basis (which assumes the tax change has no effect on the economy), the plan results in an annual revenue loss of $414 billion, or about $4 trillion over the ten-year budget window. When you account for the economic growth created by the tax reform, the revenue loss is a little more than half as much, at $1.7 trillion over a ten-year period. With interest, the cost of the plan reaches about $2.3 trillion over the next decade. However, the reform would turn revenue positive by the end of the adjustment period and raise revenue by $94 billion per year due to the 15 percent larger economy. Even with this additional revenue, it would still take until 2040 for the tax reform to raise enough revenue to cover the $2.3 trillion in accumulated deficits (chart below). The plan would also have widely shared benefits. All income groups would see higher income from the reform. 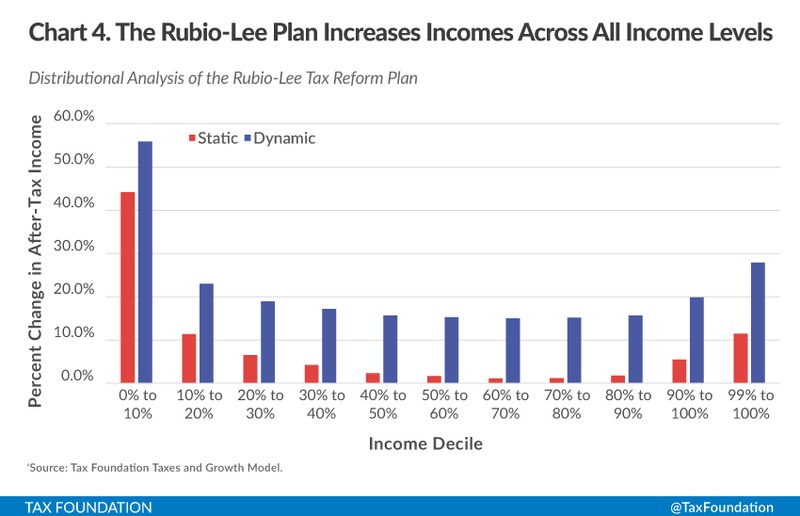 On average, the Rubio-Lee plan would boost incomes across the board by 17.8 percent. Taxpayers in the bottom two deciles would receive the largest increase in after-tax income; the bottom decile would see their income rise by 55.9 percent and next decile would see an increase of 23 percent. The reason for the large after-tax boost comes from the new refundable personal credit, the new child tax credit, and the new jobs and higher wages enabled by the plan. Top income earners would see the next largest boost in their incomes at 19.9 percent. This is due to the reduction in the top tax rate to 35 percent, the elimination of the tax on capital gains and dividends, and the significant boost to the economy from the plan. Estimates show that no group would see smaller than a 15 percent increase in their level of income. 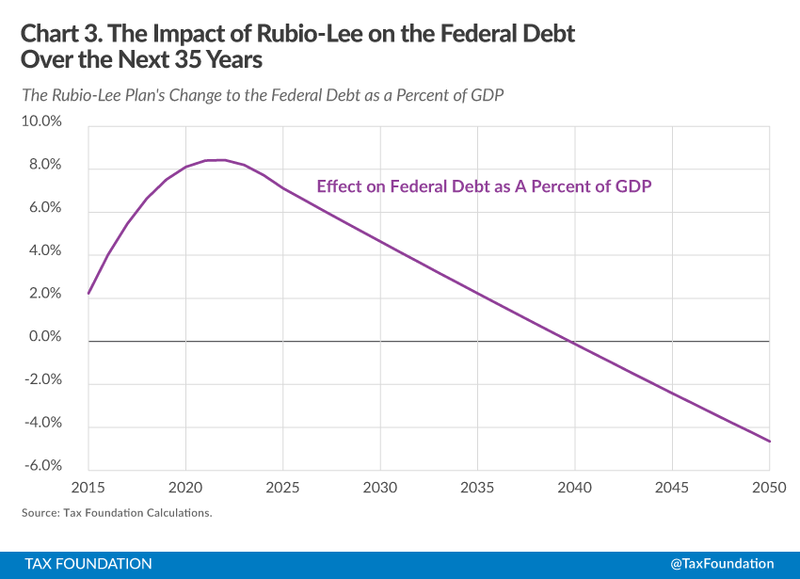 The Rubio-Lee plan addresses a number of the biases against saving and investment in the current tax code. It reduces the tax rate business income, eliminates double taxation, and fixes the treatment of capital investment. The plan loses $1.7 trillion over a ten-year period, but would increase revenue in the long-run due to a substantially larger economy. In all, the proposal would provide a large boost to the economy and create winners across the income spectrum. This post orginally appeared at Forbes.com.